The Student Chapter/Club Member Award was instituted by the Tennessee Section of ASCE in 2000. The Award may be made annually to a student chapter or club member of one of the ASCE student chapter/clubs in the Tennessee Section of ASCE, who has made definite contributions to the Society at the student chapter/club level. Reggie is a student from Christian Brothers University and was nominated by the West Tennesee Branch. She received her Bachelor of Science from CBU in May 2017 and currently works as a civil engineer at Williams-Sonoma in Memphis. During her time at CBU. She was involved with ASCE, The society of Women Engineers, and her Alpha Xi Delta sorority. She was a member of the Honor Program and maintained a 2.95 GPA. She served in every leadership role in her student chapter, and was a key member of the school’s hosting of the Deep South Conference. She has a leading role in the planning and execution of the “Grapes for Geeks” fundraiser. The Young Engineer Award was instituted by the Tennessee Section of ASCE in 1988. 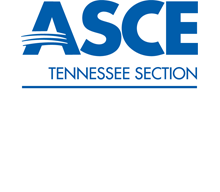 The Award may be made annually to a younger member of the Tennessee Section of ASCE who has made definite contributions to the Society at the National, Section, and/or Branch levels. A Young Engineer is one who is 35 years of age or less on February 1 in the year to the award. Mrs. Cookston is a civil engineer with the CDM Smith and was nominated by the Chattanooga Branch. She received her BS in Civil Engineering at UT Chattanooga, where she was an active member of the Student Chapter, Tau Beta Pi, and the National Honor Society. She is a registered professional engineer with 14 years of civil and environmental engineering experience. Her contributions are highlighted by her involvement and leadership with ASCE, at both the Branch and Section levels. Beginning in 2005, as an active member ASCE’s Chattanooga Branch, she began serving as the coordinator for the annual Toys for Tots Charity event, a position that she still serves in today. In 2007, she joined the Chattanooga Branch Leadership, serving as the Branch Secretary & Treasurer. Following that role, she would move on to serve as the Branch Vice-President (2008-2009), as well as Branch President (2010-2011). During this time, she worked to develop and establish the Chattanooga branch Board of Directors, as well as their current by-laws. In 2013 she began serving in the leadership of the ASCE TN Section. Initially, she served as the Vice-President of the TN Section, followed by President-Elect, and in 2015, she served as the President of the ASCE TN Section. The Govenment Engineer Award was instituted by the Tennessee Section of ASCE in 1999. The Award may be made annually to a government engineer member of the Tennessee Section of ASCE who has made definite contributions to the Society at the National, Section, and/or Branch levels. Ms. Harrell was nominated by the West Tennessee Branch and is the City Engineer for the City of Lakeland. She has been an ASCE member since 2008 and is a passionately committed municipal engineer. A proud University of Memphis Civil Engineering bachelor of science graduate, she is a home-grown talent that has served the mid-south as a member of both the City of Lakeland’s and the Town of Collierville’s engineering staff. She brings a collaborative spirit to her work and considers communication that involves really listening to others and their point of view a key element in effective problem solving. This philosophy has made her a valuable mentor to engineering interns and a great partner for the region’s municipal engineering community. She is a member the Shelby County Municipal Solid Waste Regional Board, the Shelby County Government Consultant Review Committee, and the Western Region Tennessee Stormwater Association. Ms. Price was nominated by the Chattanooga Branch and is a registered Professional Engineer in TN & VA with a B.S. in Civil & Environmental Engineering from Tennessee Technological University. She has employment history with TVA, TDOT, several private firms and currently works for the City of Chattanooga's Land Development Office. She has served the Chattanooga Branch of ASCE in several leadership roles including Secretary, Vice President, and most notably, the 2015-2016 Branch President. Additionally, she has continued her service to ASCE by serving as a Branch Membership Champion and key recruiter for potential new members. In 2016, she developed, organized, and established the annual Chattanooga Development Symposium event. This event is designed to provide knowledge, understanding, and positive networking among those involved with development in the Chattanooga Area. The Peter G. Hoadley Award for Outstanding Engineering Educator was instituted by the Tennessee Section of ASCE in 2004 with the designee being the first recipient. The Award may be made annually to an engineering educator member of the Tennessee Section of ASCE who has made definite contributions to the education process and to the Society at the National, Section, and/or Branch levels. Dr. Bennett was nominated by the Knoxville Branch. He has been on the faculty at UT since 1983 and has specialized in structures and is the director of Engineering Fundamentals Division. This division is a program design to engage freshman into the field of engineering. His contributions to ASCE are in all levels...ad-hoc advisor to the student chapter with their structural design questions, valued speaker to the Knoxville Branch meetings and seminars, published in national journals, and presenter at national conferences. His current role as director of engineering fundamentals is reflected in the later publications related to engineering education. His received his BS in Civil Engineering at Cleveland State University and his Masters and PhD at the University of Illinois-Urbana. Some of his honors include; ASCE Student Chapter Faculty Member of the Year (1986 and 1987), Civil and Environmental department Outstanding Teaching Award (1990, 1996, and 2005), the Alvin H. Yorkdale Award for his ASTM Committee C15, Best peer-reviewed masonry paper (2002), UT Alumni Association Outstanding Teacher award (2008), College of Engineering Teaching Fellow Award (2010), the Masonry Society Service Award in 201, and the Masonry Society John Scalzi Research Award in 2014. His continuous dedication to the advancement and education of the Civil Engineering profession, along with his years of service, makes him a very worthy recipient of this honor. The Outstanding Engineering Project Award was instituted by the Tennessee Section of ASCE in 1993 and is given for overall achievement so that the many civil engineers and others who have worked on the project are recognized. The project must be located in Tennessee. The owner of the project is the appropriate person/organization to accept the Award. The Award may be made annually to the engineering project that is considered to have made a definite contribution to the betterment of the citizens of Tennessee. The project must fall in the general category of civil engineering and must have been completed within the last two years prior to the year of the award. The TDOT Fast Fix 8 Accelerated Bridge Construction (ABC) was nominated by the Nashville Branch. The project demonstrated many new and innovative engineering techniques at a much larger scale than had been previously attempted. Constructed in the late 1960s, the twin eastbound bridges that intersect Herman Street, Clinton Street, Jo Johnston Avenue and Charlotte Avenue in downtown Nashville were showing advanced signs of deterioration. Though all of the structures exhibited some degree of deck failure, the Charlotte Avenue bridge experienced three major deck failure issues during the summer of 2013. This required the closure of multiple traffic lanes and an emergency weekend closure to replace two bays of the existing deck. Recognizing these four pairs of bridges along I-40 required immediate attention, Tennessee Department of Transportation. (TDOT) selected GS&P as lead design engineering firm for the $62 million bridge rehabilitation project. The scope of work included comprehensive site investigation, structural analysis and design, preparation of detailed roadway and bridge construction plans, technical assistance and research, and detailed traffic management plans. The Department wanted to complete the project within a compressed schedule to minimize the social and economic impacts to Nashville’s central business and entertainment districts, which are continually generating huge traffic demands on I-40. By using ABC versus a more traditional delivery method, it was estimated the project could be completed within a total of 13 weekend full-closure periods instead of up to three years of reduced traffic lanes. Along with ABC, Construction Manager/General Contractor (CM/GC) project delivery was selected for the effort. This involved GS&P, TDOT and general contractor Kiewit Infrastructure South Co. working together to find the most reasonable cost for the project as well as the optimum methods for completing the reconstruction of the various bridge elements. The Daniel B. Barge, Jr. Award for Distinguished Service was instituted by the Tennessee Section of ASCE in 1988 with the designee being the first recipient. The Award may be made annually to an engineer member of the Tennessee Section of ASCE who has made definite contributions to the Society at the National, Section, and/or Branch levels. Mr. Barry was nominated by the Knoxville Branch. He has served the engineering community through the ASCE for over 30 years. During his 30-year involvement in ASCE, the primary focus of his contributions has been at the Tennessee Section and the Knoxville Branch of ASCE, though he has made significant contributions throughout the country. For example, his Loring Air Force Base Remedial Action project in Limestone, Maine was nominated for ASCE’s Outstanding Civil Engineering Achievement. Additionally, Mr. Barry presented his Genetta Ditch Watershed Project for the Huntsville Branch of ASCE. Mr. Barry’s service to the Knoxville Branch of ASCE includes presentation of five technical lectures to ASCE groups and participation in eleven continuing education programs as part of ASCE. Since 1995, Mr. Barry has continuously served on committees and held office positions within ASCE. He has chaired numerous ASCE Sections such as the Environmental and Water Resources Committee and History and Heritage Committee. He has promoted the success of the civil engineering profession through acting president for this organization and many additional years as other designations. He continues to be involved in the Environmental and Water Resources Institute of ASCE as well as attend and contribute to many yearly meetings. Mr. Barry’s contributions to ASCE and his community are made all the more significant through his service focused work ethic and commitments to quality and integrity. He fosters a positive, empowering, and effective leadership style that garners him praise from his peers and the admiration of those under his leadership. In both his professional work and his service to ASCE, Mr. Barry has consistently brought these talents to bear with grace and good humor. Mr. Barry is also fiercely dedicated to empowering and encouraging the next generation of engineers. As an ASCE champion, he motivates others to get involved, and develops young engineers by encouraging their contributions to presentations and papers, and by engaging them to attend conferences and interact with others to enhance their professional development. He is also a strong advocate for continuing education and maintains a commitment to life-long learning. Mr. Barry’s continuous dedication to the success of ASCE and his service as an empowering leader makes him a very worthy recipient of this award.